Chevrolet CERV III of course... what do you MEAN you've never heard of it before? For this week's "Where are they now?" post I'm going to be talking about a developer that's probably not as well known on the PC gaming scene but nevertheless worked on a game that was quite memorable for me and that game was Test Drive III: The Passion. The game was probably one of my earliest experiences with a 3D VGA open-world car racing game and it's the experience I had with this game that shaped my future expectations with respect to titles like Test Drive Unlimited and Test Drive Unlimited 2. The developer I'm talking about was responsible for the graphics and design of Test Drive III and his name is Tom Loughry. Tom seems to be especially famous for his games on the Intellivision console during the early 80s and this is where I'm getting most of my information about the guy since information elsewhere on the interwebs is sparse. So without further ado, lets see how Mr Loughry started, what he did in the industry and where he's at nowadays. Tom apparently got his start in the game development industry by helping some friends who were working for a company called APh Technological Consulting. APh was a company that was contracted by Mattel (yes, the same company that sells Barbie dolls) to develop games for its Intellivision console which was released in 1979. Tom gained a reputation as a "finisher" and was nicknamed "the fireman" because he knew how to get stuff done and was often finishing other developers' projects. Tom's first game at APh was Boxing which was published in 1980 and this would be the first of three games that he would not start himself but instead be responsible for finishing (all three games were started by different developers). His second game was 1981's Sub Hunt which was started by John Hershberger (who is now a prominent computer scientist) and his third would be 1982's Advanced Dungeons & Dragons aka Cloudy Mountain. Tom finally got to work on his own game from start to finish when he developed 1983's Treasures of Tarmin but it was also around this time that APh management was becoming a bit "unstable" and almost all of APh's senior staff left. Tom then worked on some console games for Activision such as Worm Whomper (1983), The Dreadnaught Factor (1983) and Alcazar: The Forgotten Fortress (1985). After working at Activision, he ended up at Accolade. It's about this time that Tom started to mainly work on PC games. While there he developed the first-person tank game, Steel Thunder (1988), Test Drive III: The Passion (1990), Gunboat (1990), Grand Prix Unlimited (1992) and Speed Racer in the Challenge of Racer X (1993) . Tom then worked at EA in the late 90s helping EA develop PGA Tour 96 (1996) and Need for Speed III: Hot Pursuit (1998). 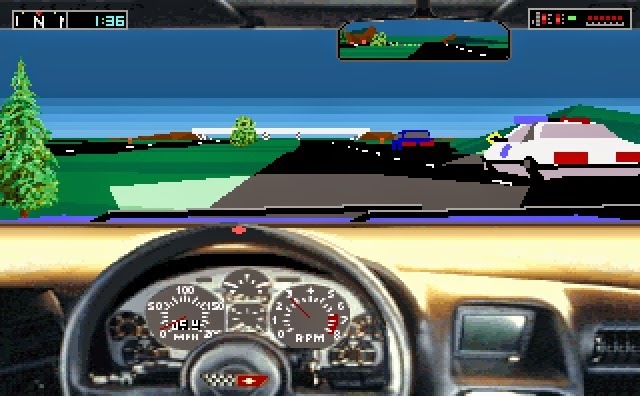 An interesting bit of trivia that Tom mentions is that the lead programmer for Need for Speed III was noneother than Brad Gour, who used to also work at Accolade (on the first two Test Drive games) before leaving for Distinctive Software Inc. Brad's departure from Accolade is also the reason Tom was given the task of developing the third Test Drive game. Unfortunately, while working at EA Tom sustained a "severe overuse injury" and ended up "destroying a tendon" which put him out of commission completely. Consequently, it's been over a decade since Tom has been typing at a keyboard let alone developing any games. He does seem to be receptive to his fans though, being a guest on a podcast called Intellivisionaries only a few months ago. Accolade Activision retro Tom Loughry Where are they now?